I believe that exercising not only helps to keep fit, it also keeps a family together. That, plus the fact that my girl is such a little sprinter and enjoys running, makes me very hard for me to reject any opportunity for us to participate in fun races. 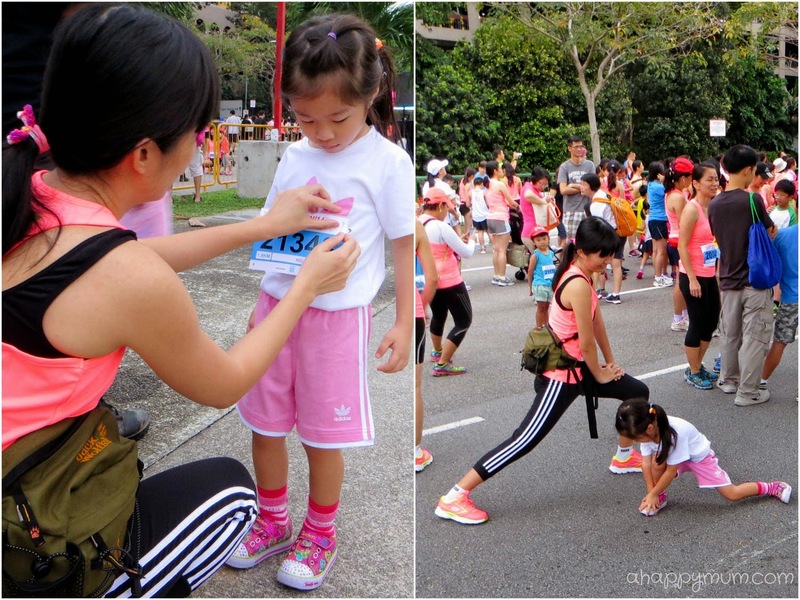 Remember my first run with Angel at the Cold Storage Kids Run 2014? 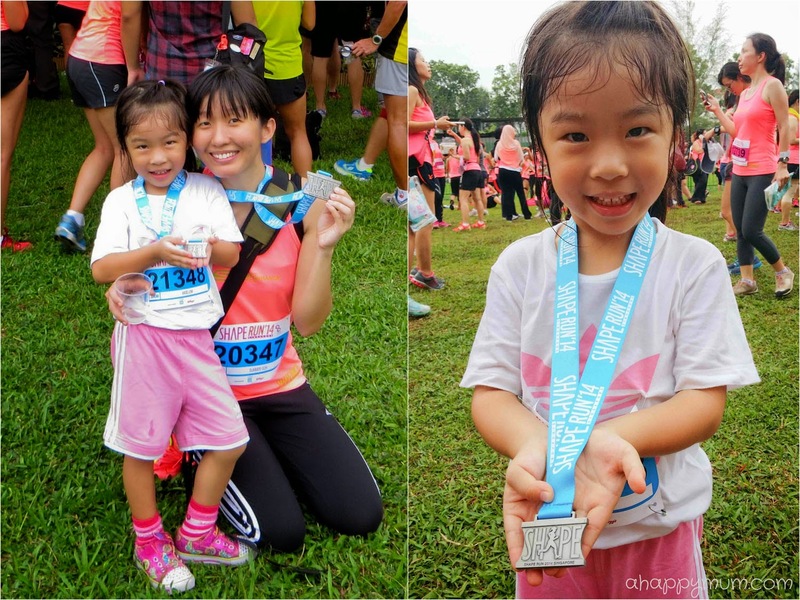 This month, we decided to further challenge ourselves by taking up the Me and Mini Me Fun Run at Shape Run 2014, which was more than double of the distance we covered previously - yes, it was going to be our first 1.8km run as mother and daughter! 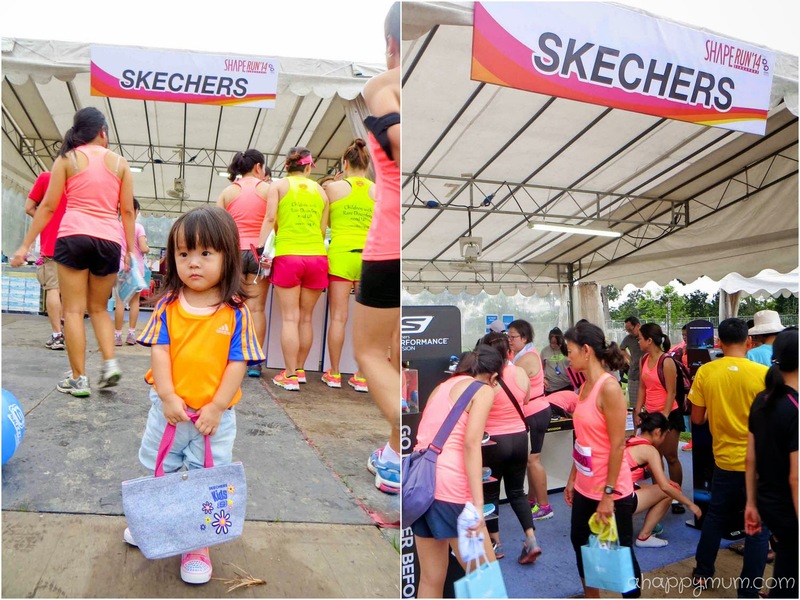 Thanks to Skechers, we were all set to run in our pretty new shoes! I received a pair of the hot pink GoRun Ride 3 which has enhanced Resalyte cushioning to help you go the distance and the shoes felt amazingly light and comfortable. As for Angel, alas her feet were too small for the mini version of the GoRun Ride 3 and after some consideration, she made the decision of choosing this pretty pair of Twinkle Toes: Shuffle - Glow girl shoes over another pair of running shoes. I don't blame her though, which girl can resist the colourful sequins and bright lights that blink with every step? So, while I was chided by the hubby for letting her wear this pair of heavy shoes for a considerably long run, I wanted her to take responsibility for her own decision and let her know that since it was her choice to run with this shoes from start to end, she couldn't use it as a reason to quit halfway. Surprisingly, these pretty shoes were more comfortable than they looked to run in and not once did she complained during the entire 1.8km. Well, I guess when it comes to running, it's all about the attitude and perseverance more than the footwear, right? In any case, these light-up girly shoes were too pretty to resist so we got a pair of Twinkle Toes: Shuffles Light for the little sister too, which made her squeal in delight with every step she took. We are all ready to run! Shape Run 2014, the ninth edition of Singapore's original women-only running even, was held at Nicoll Highway last Sunday and attracted over 9,000 participants. This was the first time the Me and Mini Me Fun Run was held and it served to encourage mothers to run with children below the age of 10. At 6:15am, we sprang out of bed and even though our flag off time was 7:45am, we arrived at the starting point early and had ample time to do warm-up, put on our race bibs and of course, take some pictures! I was clad in the bright Skechers Runner's Top that came in the race pack and an Adidas pants while Angel was clad in white and pink Adidas kids wear (Thanks to the $200 Adidas vouchers we won in the AIA Bento-making challenge previously). Finally, we were all set at the starting line and awaited eagerly for the horn to sound! Once it did, we started off with slow, steady steps and waved farewell to the hubby and little sister. You know, even though it was part of my responsibility and personal desire to capture some pictures and videos of the girl in her first long run, all that became quite distracting as I had to take out the camera from the bag, run with it in my hand, run backwards to capture some shots or dashed a distance ahead and turned back to take a picture of her against the crowd. In fact, she was running so steadily and it was only when I said "Mummy take a picture for you, okay?" that she stopped to put a victory pose. I actually meant to take a picture of her in motion but of course, she thought I wanted her to stop and pose which was the last thing I would do in a race for fear of losing the momentum. Thus, soon enough, I decided to just chuck the camera in my pouch and concentrated on running the race with my girl - just me and her against the world. When we made the halfway mark and U-turned, that was when I cheered her on and told her to accelerate. For that entire second half, I was chanting "Go, Angel, Go! ", "Look, we are getting closer to the finishing line! ", "Breathe, in, out, in out! ", "Never give up! ", "Let's dash to Papa and Meimei!" and "C'mon, you can do it!". Unlike our previous 800m run where she was still full of energy nearing the end, I could see that she was running a little short on breath this time round and therefore though she nodded her head from time to time, she wasn't giving me any form of verbal reply. Still, I knew that my words of encouragement were working and she was pushing herself beyond her limits, beyond what she thought she could achieve. When the finishing line came in view, we held hands and gave our final burst of energy by dashing as fast as we could. Yippee! We completed the run and achieved a timing of 14min 30sec, which I would think was quite a commendable effort for a soon to be 5-year-old. That feeling of triumph as mother and daughter was something indescribable, it felt a little surreal and yet full of joy and satisfaction. But more than a good timing, I rejoiced at the fact that my girl could put into practice what it means to never give up. Well done, my dear Angel! After the run, the two of us queued up patiently to get our finishers' tee and something that could not be missed - our medals! Even though it took us a good 20 minutes to slowly move along the the queue till we got our turn, we amused ourselves by looking for bugs and insects among the grass and when we finally laid our hands on our medals, that totally made our day. For the Me and Mini Me Run, there were matching Mini medals awarded to the little runners too, how cute! Since we had time to spare, we also walked around the sponsors' booths to check out the merchandise, watched the prize presentation for the winners of the competitive races and had fun dancing along with the live Zumba performance. Big thanks to Skechers for all the lovely goodies! The kids totally loved the grey and pink mini bags! You know what? Even though it was right after a 1.8km run, unlike the previous one, I actually felt very rejuvenated this time round and was already looking forward to our next run as a family. That said, you have to understand that running had never ever been one of my favourite sports when I was young. If there is anyone who motivates me to be a better runner, it is my big girl. The way I see her determined look, the way she says she is going to be the champion, the way she seems to fly on her two feet, all that only inspires me to be reach beyond my limits too. So, here's a big THANK YOU to Skechers and Shape for the wonderful opportunity to be part of this year's run. We had an absolutely fun and awesome day and this would be such a precious memory and milestone for us as mother and daughter. Well, I'm now looking forward to the day when I can run as mother and daughters! Yes, and have not just one, but two girls with me! Judging from how Ariel now likes to play catching with the big sister and can run for rounds at the playground, I think the day is not far off. Till more fun-filled family runs! 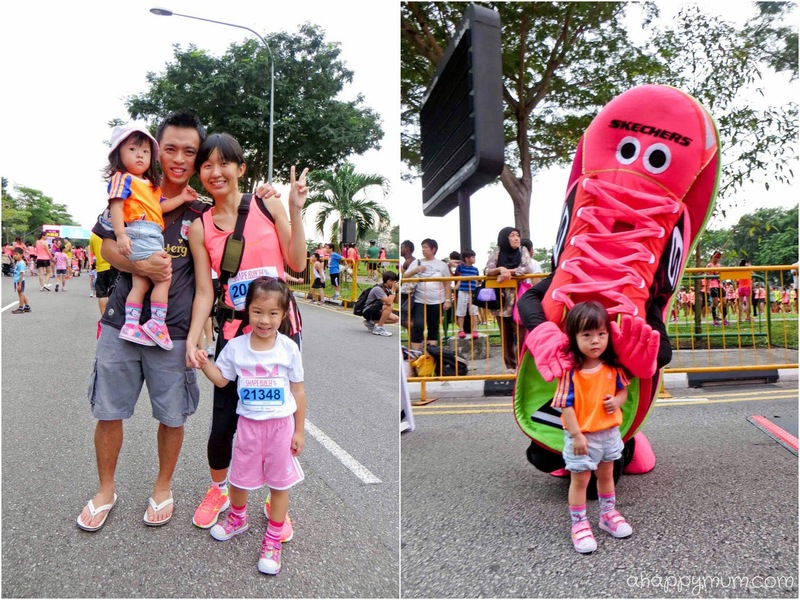 Disclosure: We were invited by Skechers to take part in the Me and Mini Me Fun Run in Shape Run 2014 and received the above complimentary shoes. All opinions are our own.